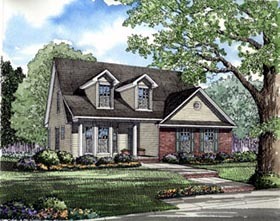 Twin, gabled dormers topping the covered porch create a friendly contrast to the single large gable adorning the garage. The foyer leads into the dining room, which has direct access to the kitchen. U-shape counters line the secluded kitchen, including a snack bar that seats four. Sharing the snack bar and featuring a bay window, the breakfast room is a comfortable place for casual meals. The dining room leads into the great-room, which is embellished by a fireplace and door to the backyard. The master suite fills the right rear corner of the main level. The two secondary bedrooms share the upper level with a full bath and attic storage. There is an additional bonus room offering 145 square feet of space, ideal for another bedroom or an office. This home is designed with a slab foundation.